Artificial grass is an excellent choice for your playground surface due to its realistic appearance and soft cushioned base that helps to protect children against impact injuries. The advantages of artificial grass are that children will not be treading muddy feet inside the school building and parents won’t have to worry about washing soiled uniforms from children playing on the grass. A foam base can also be applied to the artificial grass to provide extra protection from falls underneath playground equipment such as slides and climbing frames. Maintenance of artificial grass is minimal with just occasional brushing recommended by most manufacturers. However, annual inspections are important if you are using the turf as a playground safety surface. Artificial grass is supplied in rolls (like carpet) and should be installed by a professional fitting team. They will ensure that seams are correctly joined and edges are properly secured. The result is a playground surface that looks like natural grass and from a distance its often impossible to tell the difference. For this reason, many schools choose to install artificial grass for landscaping in addition to using it for their playground surface. Economy grass is a cheap product because the pile height of the synthetic carpet is low (the fibres that make up each blade of turf are short so less material is used in the manufacturing). The advantage of economy grass is its durability, which make it a popular choice for large venues that require a cost effective flooring solution. Due to the low pile height, economy grass can cause abrasion injuries (astro turf friction burns) and is therefore unsuitable for sports or playground surfaces. Mid-range artificial grass is suitable for playground safety flooring because it has a longer pile height for better comfort and softness. If you are looking for a realistic appearance, the green artificial grass is often presented in a dual tone that mimics natural grass. A variety of other colours are also available to add vibrance to your school playground; many schools choose bright colours for play areas and natural green for their sports and landscaping areas. Premium artificial grass closely imitates the appearance of natural grass with a synthetic moss infill and non-uniform pile height. The difference between mid-range turf and premium turf is often just aesthetic because both surfaces are soft and comfortable. Thin fibres, multi-tone colours and the moss infill inflate the cost of this product, which looks true to life and is ideal for landscaping and gardens. However if you are looking for a playground surface, you should normally choose a mid-range artificial grass. 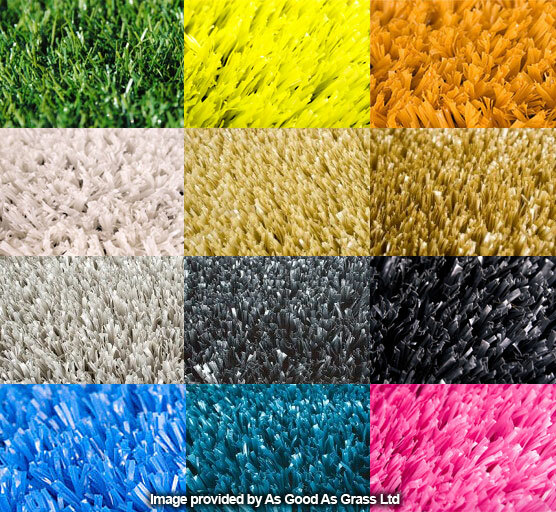 Ask your artificial grass supplier for a selection of samples before choosing a product. The e-layer can be applied to any artificial grass product. After you have chosen an artificial grass for your playground, you can then choose what type of underlay to apply. The thickest e-layer is approximately fourty five millimetres and provides fall protection up to heights of two and a half metres. Thinner e-layers are considerably cheaper but offer less protection. The e-layer (shock pad underlay) absorbs much of the force on impact and test results show the critical fall height, which is the maximum height for a safe fall. A range of e-layer systems have been developed with varying types of foam, thickness and density to achieve the most effective impact absorbtion. Some artificial grass suppliers only sell and install the turf surface (no HIC tested underlay) so ensure that your provider is experienced with e-layer technology. Artificial grass with shock pad underlay is a very effective method of providing a safe envirionment in the school playground. A list of artificial grass suppliers is provided below. Artificial grass playground surfaces by Royal Grass provide a safe and child friendly environment. Their synthetic turf product range includes over twelve colour variations. Artificial turf sports fields by GreenFields use e-layer technology to provide safe and comfortable playing surfaces for football, rugby, tennis, hockey and baseball. Child friendly artificial lawn – An article on how artificial grass is used as a safety surface underneath play equipment. Head Injury Criterion – Details on how HIC is measured and how it applies in sports and recreation activities. Pupil health and safety – Government guidelines on a school’s responsability for its pupils safety both in the classroom and outdoors in the playground.